In ecclesiastical law. A parish or church in England which has jurisdiction of ecclesiastical matters within itself, and independent of the ordinary, and is subject only to the metropolitan. singular, extraordinary, remarkable, exceptional, surprising, distinct, own, typical, inquisitive, strange-looking, bizarre, uncanny, especial, eerie, puzzling, exclusive, alien, quirky, astonishing, abnormal, freaky, intriguing, privileged, different, creepy, extraneous, clean, unfamiliar, endemic, eccentric. general, standard, ordinary, abnormal, uncharacteristic, like, similar, unimportant, common, commonplace, usual, normal, vague, Resembling, regular, indefinite. 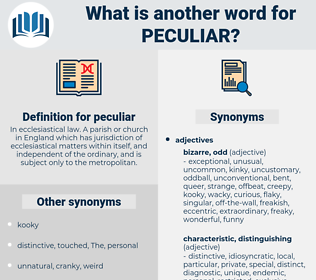 expected, routine, universal, prevalent, shared, widespread, atypical, generic, generalized, frequent, customary, conservative, predictable, typical, plain, garden, untypical, conformist, natural, wonted, broad, nonexclusive, habitual. Tom favoured his father with a peculiar wink, and the old gentleman felt in his pockets once more, to be sure that he had not flung something out with his handkerchief. There, standing with his back to the room, and his hands crossed in a peculiar fashion, he uttered the word, " Jesus," and paused.